January: month of packed gyms and plentiful summer produce - it must be salad season. I'm not really a big New Years' resolution person (I'll make a resolution any old time!) but always embrace lighter summer meals at this time of year, so I've got a few salads to share over the next few weeks. This one is a fairly versatile combination of flavours that could be a light meal in its own right, or served on the side. We had it for lunch with friends with a particularly delicious quiche, but I can imagine it as my lunch any day, or even dinner on a hot summer evening when cooking a full meal doesn't appeal. I'm a big fan of South East Asian cuisine. I haven't spent any time in that part of the world (yet) so haven't experienced the real thing first hand, but I love the abundant use of crunchy vegetables with sweet and spicy sauces, and the just-so textural combinations. We got My Food Bag for a while and many of Nadia Lim's recipes have a Malaysian or Thai bent to them, and that helped pad our pantry out with the relevant ingredients, as well as bolstering my confidence. This salad will survive well for three to four days in the fridge, so it's perfect for lunches - just keep the dressing separate and dress each portion as you come to eat it. You can leave the chicken out if serving as a side - but it's great protein if going for the meal option. 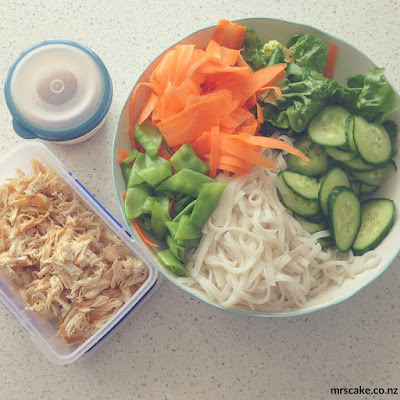 You could also omit the rice noodles if you want a purely veg salad - though you'd probably only need half the dressing if leaving both out. I used large flat rice noodles but the tiny angel hair ones would work just as well - follow the cooking instructions on the packet to hydrate them since it varies on size. The dressing is simple but effective - we use an extra spicy sweet chilli sauce but if you prefer a milder flavour just use a less punchy sauce and you'll be grand. Do you make New Years' resolutions, or just go with the flow? Cook the rice noodles according to the instructions on the packet. When cooked, rinse in cold water then drain. Shred the chicken. Thinly slice the cucumber. Shred the carrot into ribbons using a vege peeler. Roughly chop the cos and peas. Finely chop the mint. Toss the salad together in a large bowl. Combine the dressing ingredients then toss through the salad. Sprinkle the sesame seeds over the top.